Indian Summer CAL week 4 is out now for you to download on the Deramores website. 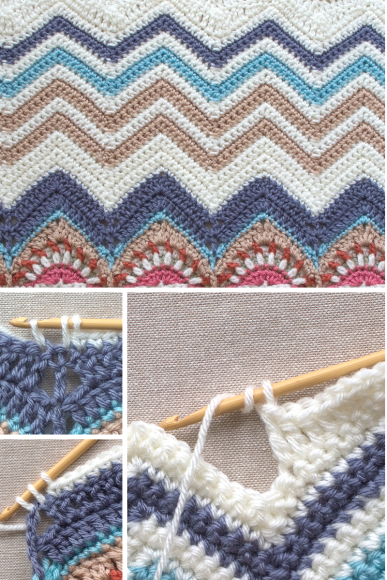 In the fourth part of the pattern we’ll be adding a ripple section to the two strips we’ve been working on. Picking up from where we left off, we’ll be adding more rows on one side of each strip, working onto the arched edge. We’ll be using just basic stitches this week to add the ripple section. I hope you enjoy this weeks pattern! Next week we’ll be working some squares so won’t need the strips we’ve been working on – leave those blocking. Hope you enjoy week 4! Indian Summer CAL Week 3 – Out Now!Indian Summer CAL Week 5 – Out Now!